The Symptoms of Overtraining: Are You Sabotaging Yourself? If you know the symptoms of overtraining you can avoid running yourself into the ground. And this will help you tons, short term and long term. Overtraining not only injures your body, but drains your mind and saps your enthusiasm as well. Find out what it is, and diagnose it early so that you don't burn out. "Excessive frequency, volume, or intensity of training that results in extreme fatigue, illness, or injury (which is often due to a lack of sufficient rest, recovery, and perhaps nutrient intake)." "…[The] accumulation of training and/or non-training stress resulting in long-term decrease in performance capacity with or without related physiological signs and symptoms of overtraining, in which restoration of performance capacity may take several weeks or months." Basically, it's working out too hard, too long, or too intensely. If you do this for a long time there can be severe physical (and mental) consequences. Overtraining is also referred to as overtraining syndrome, staleness, burnout, chronic overwork, physical overstrain, and overfatigue. A lot of words for being tired and pushing yourself too hard. Overtraining doesn't happen in an instant, or over a few days. Real overtraining means wearing yourself out too much over the course of weeks or even months. Also, whether overtraining occurs is heavily dependent on who's training. Your individual genetics, history of physical activity, other stressors, and individual response to the exercise all play a role in determining what overtraining is for you. And you can't reverse its negative effects just by taking a weekend off. You've been digging yourself into the hole for a while, so it'll take weeks or months to recover from it. Overreaching is the little brother of overtraining. It's what happens to you if you push too hard for just a few days or a week. Since overreaching is overtraining on a smaller scale, you can recover from it fairly quickly. A weekend or a few days of taking it easy should see you doing fine. Overreaching is not always a bad thing. Overreaching followed by a recovery period at the end of a workout program can give you substantial gains in strength and power - when you start working out again. Thus, many workout programs culminate with pushing you a bit too hard at the end. All right, here are the symptoms of overtraining to watch out for. Try to catch overtraining when it's just starting to kick in. Later, it's a lot more painful to correct. If you feel tired or fatigued for a few days, it probably isn't anything. But if you frequently have the symptoms below, consider taking a rest. A decreased desire to train and ability to take joy in training. Less vigor, motivation, and confidence. If taking a rest helps, then the problem was probably overtraining. If it doesn't help, then maybe the problem is not just overtraining – and you should look into other causes. Decreased economy of effort (sloppy technique). A high level of fatigue. Decrease in max heart rate. Self-diagnosed high stress levels and sleep disturbances. 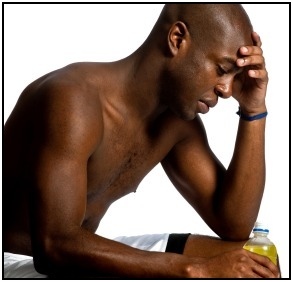 Frequent muscle soreness, fatigue, and irritability. The declines in performance, despite continued training, are that last part of overtraining to show up. When you've gotten to the point where you can't fake it to yourself anymore and your excessive practice is actually harming you, you need to stop. Or you will hurt yourself. Taking a rest sometimes can be hugely beneficial, both physically and psychologically. And when you come back and start training again you'll feel refreshed, rejuvenated, and enjoy getting better at your sport all the more. • Click here to leave 'The Symptoms of Overtraining: Are You Sabotaging Yourself?' & go back to the Complete Strength Training Home-page! 1. Baechle, Thomas R., and Roger W. Earle. 2008.Essentials of Strength Training And Conditioning. Champaign, Ill: Human Kinetics. Pp. 114. 2. Garrett, William E., and Donald T. Kirkendall. 2000. Exercise and Sport Science. Philadelphia: Lippincott Williams & Wilkins. Pp. 487.